The annual Little Way Novena in honour of St Thérèse of Lisieux begins in St Eugene's Cathedral on Saturday, 12th May at 7.30 pm with Mass and the Anointing of the Sick. From Monday to Friday there will be Novena Masses at 6.30 am and 10.00 am. Each evening from Monday to Friday at 7.30 pm there will be a time of prayer. During this time there will be a guest speaker and also a time for silent prayer in the presence of the Eucharist. On Sunday evening (13th May) at 6.00 pm during a time of prayer and devotions Bishop McKeown will speak. The speaker on Monday evening (14th May) is Kathleen Chada is from Tipperary. Kathleen will speak to us about living with indescribable pain in her life after the murders of her two sons. On Tuesday evening (15th May) Fr Dermott Donnelly is a priest from Newcastle in England whose parents are from Co Derry. Fr Dermott is a pioneer in youth ministry in England and might have a famous brother?! On Wednesday (16th May) Archdeacon Robert Miller is our neighbour and friend who loves speaking at the Novena! On Thursday evening (17th May) Donna Taggart is from Omagh. When Donna recorded the song Jealous of the Angels she received 80 million Facebook views. On Friday (18th May) Freddie Pimm is a doctor in the NHS, training as a GP. He is the author of The Selfish Gospel, a book exploring how the church can better transform the world, where we're going wrong and how we can start to fix it. The Novena promises to be a time of great joy. It will be an opportunity for people to come to the Cathedral and ask St Thérèse to pray for them. 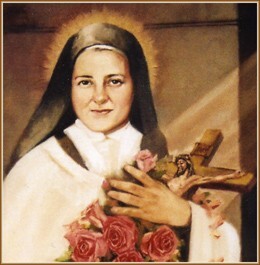 St Thérèse is a very powerful intercessor with God. Asking her help can bring great healing and peace in life. Everyone is welcome to Saint Eugene's Cathedral for this time of prayer and petition. Mass for the Dead on Saturday, 19th May at 10.00 am. Closing Ceremony and Blessing of Roses on Sunday, 20th May at 3.00 pm. St Thérèse candles available at the back of the Cathedral.